Smartphone usability rating: 3/5. No mobile page for smartphones. 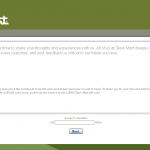 You are can still finish Stein Mart Customer Experience Survey via smartphone. Select the date of visit and enter the 4-digit transaction number, 5-digit store number and total purchase number shown on your receipt. Select answers to the questions related to your visit like "What time of the day did you visit Stein Mart?" and so forth. Answer the open question "What, if anything, could Stein Mart have done better to improve your most recent shopping experience?". Rate the store regarding the associates, your shopping experience based on your most recent visit. Select answers to the questions about yourself like your age, gender, etc. Enter your personal contact information like your name, phone number and so forth and click "Next" to finish the survey. Founded by the current chairman's grandfather just after the turn of the 20th century, the Stein Mart concept has evloved into a nationwide network of easy-to-access freestanding stores. The merchandise includes current-season, brand name fashion for women and men; accessories; home decor, linens; and shoes. All are at prices up to 60% below department store prices, every day. Visit survey.steinmart.com and try your luck! I tried to complete the survey however on the first page I got a message that the transaction number s/b 1000 to 9999 ! What is this ? My four digit number was less than 1000 but still four digits. I love this store. I only wish I had access to one in Wyoming/Colorado. Everytime I am visiting Rockwall, TX I visit the Steinmart store. In fact I have spent a lot of money there in the last four months. Love the products. I believe her name is Tammy and what a gem she was. I'll be back just because of her. You should have more people like her. Thanks for listening. I love Stein Mart clothes. I would like for the sale coupons to be valid from Frday to Sunday. I enjoy shopping at Steinmart and finding the great bargains there and the quality clothes that are available! First time Stein Mart shopper. My sales associate, Loetha Partee, was awesome. Due to her, I will be a life long customer at the Flower Mound store. the cashier was not very nice. almost to the point of being rude. YOU CAN'T GET SIGNED ON FOR THE SURVEY !!!!!! I just want to take a minute to tell you about a wonderful person you have working for you at your store on Alantic Blvd Jax Fl. store number 00309. Her name is Sakwa I made sure to find out her name as It was my first time in Steinmart and she was beyond helpful and I wanted to just take the time to tell you as she is a asset to your company. I have met many sales people but not like her. She didn't bother me like some do but was always close by to answer any questions I had and told me the areas I need to go to , to find what I was looking for. Cannot get into your customer service survey to try and win prize. See someone else replied that your website doesn't work with the surveys? I had a very pleasant experience, January 30, 2014 at the Johns Creek, GA, Stein Mart Store. While my husband waited in the car, I ran in to check if any stand-alone jewelry boxes were still available after the Christmas rush! Unfortunately, they weren't on sale, but there was one boxed unit still available and JoAnn quickly brought it to me from the storage area in the back! She offered to open an account so I could save 10% since it wasn't on sale! It only took a matter of minutes! Jo Ann was extremely helpful, very courteous and offered to carry the box to the car. Always friendly at my Valrico, Fl store. Anytime I visit any of your stores the employees seem to be just as friendly. The 2 times I wanted something located and sent to me, the associates were great. I would like to know how do you expect for your customers to participate in any surveys when your website does not function. We, as customers miss any opportunities for winning if there is always errors on the page. I feel you should compensate us with something besides a coupon for the problem we have deal with concerning your website. I love going to see the colors and get the great deals. I love Steinmart. I always shop there first if I'm looking for clothing. I know I will always find something that works for me. I just wish the petite department had a better selection. This was my first trip to Stein Mart and I was disappointed as the petite section was small and did not have the styles in the regular sizes. I also did not see any wide width for shoes. I did not encounter a salesperson in my search. My husband did buy a jacket and it was small which he needs. The stor clerks are very friendly and always willing to go an extre step. My arms were full as I was having great luck finding bargains. The girl offered help and went to get a cart for me ....she was soooo kind. I like shopping at Stein Mart. Whenever I can not find something the sales associates are more than happy to assist me. I love Stein Mart! The current selections are great. Good prices . I am a very frequent Stein Mart customer and have been for many years. Usually I do shop on store #011. I have also patronized fashion shows in which your line of clothes and accessories had been showed. My experience, through the years has been very positive. Your employees nice, and helpful, I know some of them by their first name since I am dealing with them for long time and many faces are very familiar. They recognize my too. My last visit to this store, was last Saturday, August 10th and I was delighted that once again, I found "treasures" at resanoble prices, and that Angela G. checked me out like she has done tons of times always with a good attitude and a friendly smile. I find all the cashiers at Steinmart's very helpful, courteous and quick, especially Debbie. Was treated with the utmost respect at the checkout counter. This was a combination visit - purchase Easter decorations and buy a birthday present both of which were accomplished with ease. I have been shopping at Steinmart for over 20 years. It's my favorite stylish store! Very satisfied! I am a happy camper for Steinmart. My slip says to go to this website to answer a survey to qualify for a chance to win a prize. How many hoops must I jump thru to enter???????????????? There is no place tp enter here!!!!!!!!!!!!!!!!!!!!!!!!!!!!!!!!!!!!!!!!!!!!!!! !